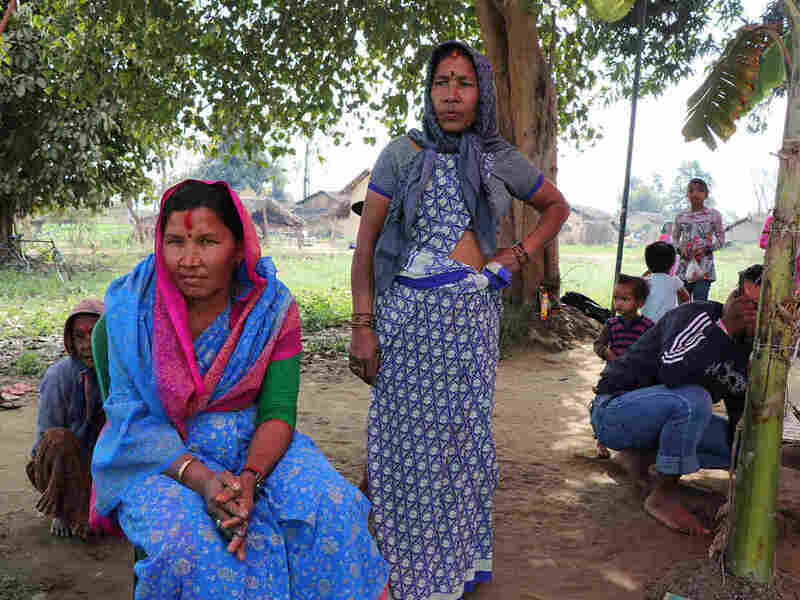 Rural Women In Nepal Need More Than Education And Opportunity To Overcome Discrimination : Goats and Soda They don't make the headlines, like women in Hollywood and the corporate and political worlds who are fighting for equality. How can the world help them overcome harassment and discrimination? Sarita Chaudry is a first-grade teacher but she does not lead a fully independent life. From Hollywood and Bollywood to the media, NGO and corporate worlds, stories about harassment and discrimination against women in the workplace have captured global attention for months. And rightly so. But what about the millions of rural women facing these injustices, who almost never make the headlines? Development agencies have struggled to find ways to help rural women overcome obstacles in male-dominated societies and to gain an education, to own land, to take out loans, to earn a living and to gain equal rights in all arenas. 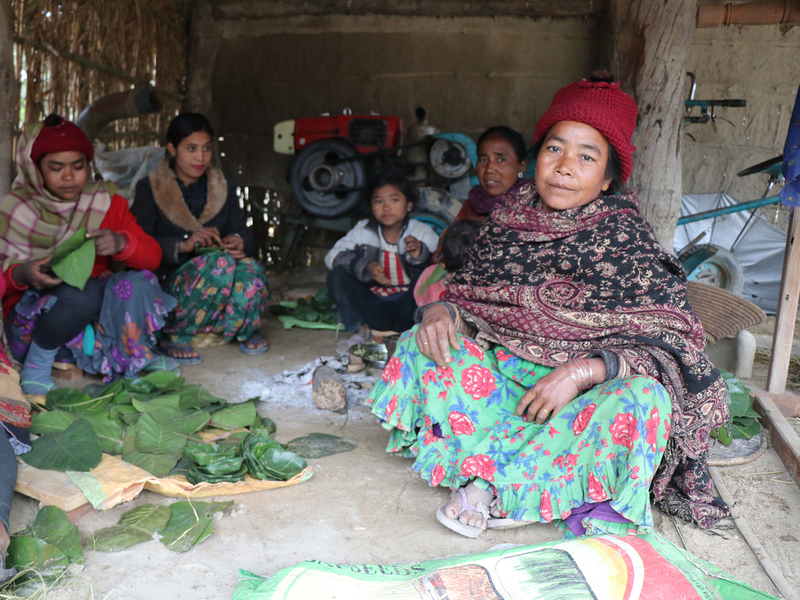 But what we've seen while conducting research in Western Nepal is that sometimes the best projects don't lead to the best results – that a woman's right to make decisions doesn't always follow from the conventional measures of success like education or income. We also saw that some women gain power through unexpected pathways. With respect to education, 26-year-old Sarita Chaudry, whom we interviewed a few weeks ago, would get high marks. She finished 12th grade and is now a first-grade teacher in Kuti village. The more advanced math skills she learned at school also enable her to handle the accounting for a women's savings group on a volunteer basis. She is married and is a mom. But Chaudry does not lead a fully independent life. Despite earning more than her husband, she told us she can only shop for food and household goods in his company – and needs his permission to buy them. Furthermore, she does not challenge these norms but accepts them as "natural" because this is how things were for her mother. Ujeli BK, seated, runs the family farm while her husband works abroad. She faces discrimination from men but is determined to forge ahead. By contrast, 39-year-old Ujeli BK would seem to lack the resources that Chaudry has. She is not educated and owns only a small plot of land. She uses two initials as her last name instead of its spelled out form, which denotes her low social status as a dalit or "untouchable." Ujeli's husband works in India as many Nepali men do, especially in the south, because higher wages can be earned across the border. He only visits once or twice a year during the festival season. Life is tough for Ujeli, who lives in a small mud hut and has four children. She grows lentils, cauliflower, eggplant and rice, depending on the season, but has difficulty finding help to plow her land as labor is scarce. Women are not able to take on this activity as they are not taught to handle the equipment, and it is believed a woman plowing land can invoke disaster. Unable to afford her own irrigation equipment, she has to rent a pump to water her fields, but its owner lets her use it only at night. A male neighbor threatened violence against her when he wrongly suspected that she had been stealing vegetables from his land. While recounting the story, Ujeli remained calm and added that if her husband was present, her neighbor would likely not have felt emboldened to make threats against her. Despite these circumstances, Ujeli told us she has succeeded in cultivating the confidence to take on "male" responsibilities and make her own decisions. She said that even if she had no husband at all, she now feels like she could take care of herself. She developed this confidence, she remarked, because she had no alternative. She knew she had to coordinate the irrigation of her fields and perform other traditionally "male" roles or else she would not be able to provide for her family. Each new step, from beginning to drive her husband's motorcycle to managing the irrigation equipment, gave Ujeli confidence to take on even more. Krishna Devi Chaudhary, a widowed mom, knew the future of her children was in her hands alone, so she found the courage to act outside the norms for women in her village. Krishna Devi Chaudhary's husband passed away years ago, while her two sons were toddlers. She entered uncharted territory, as she began managing the household and vegetable fields on her own. Like Ujeli, she struggles to gain access to the tools she needs. With limited funds, she has to bargain with her neighbors over the rental price of irrigation pumps. She carries the cauliflower and eggplant she grows on her back to local markets as she does not feel able to ride a motorcycle, which is usually a culturally taboo for women. Yet Chaudhary, now 41, told us she has found a hard-won sense of independence and authority. Knowing that the future success of her children was in her hands alone, she found courage to act outside the norms for women in her village, such as seeking out men to bargain for equipment. As further proof of this empowerment, she will attend the upcoming wedding of one of her sons, to which 500 guests have been invited. According to local tradition, the woman waits at home for the married couple to arrive, but as her husband is no longer with them, she feels she can attend in his stead. The experiences of these women, reflecting our survey results from 150 rural households, tell us it is time to rethink the way we assess and promote women's empowerment. In rural areas, practical steps alone, like providing the means to bring goods to a market or to obtain equipment, cannot create lasting change as long as women remain largely unable to make decisions independently of their husbands and male family members. The first step toward empowerment is helping marginalized men and women recognize the injustices they face and realize that they have rights and choices. We and our partners in Nepal are working to improve upon the "Women's Empowerment in Agriculture Index" – a method used widely by the Feed the Future initiative of the U.S. Agency for International Development (USAID) to measure progress toward gender equality in rural households. We believe that rural women's inward determination to challenge oppressive gender norms — what we have termed their critical consciousness — is an important missing step in bringing about their empowerment. We believe that engaging men and women in the community through workshops and discussions on gender issues is a way to break down the barriers holding rural women back. We have used role playing successfully in communities to help both sexes become more aware that prevailing gender norms can be changed. "Women can work as well as men," one male participant, Kamal Bishawkarma, told us. "That is what the training has taught me." As the headlines teach us every day, apparent signs of progress toward gender equality are masking what can be oppressive and abusive realities for women. This is just as true in the remote farm households of Western Nepal as in the gleaming corporate offices of the industrialized world. "I make decisions. My sons listen, and they follow," Krishna Devi Chaudhary, the 41-year-old single mom, told us. These words of authority and conviction should be the words by which women's empowerment is measured, in any village and in any society. Floriane Clement is a social scientist with the International Water Management Institute (IWMI), which leads the CGIAR Program on Water, Land and Ecosystems (WLE). Corey O'Hara is a doctoral candidate at Tufts University, Friedman School of Nutrition Science and Policy, USA. The journal World Development recently published their findings from Western Nepal on the measurement of women's empowerment.